Like the song says, “June is busting out all over!” But before it concedes to July and the bold colors of summer, June is holding a formal affair before things really heat up. The following garden guests, white flowers all, have donned their best to graciously welcome summer. 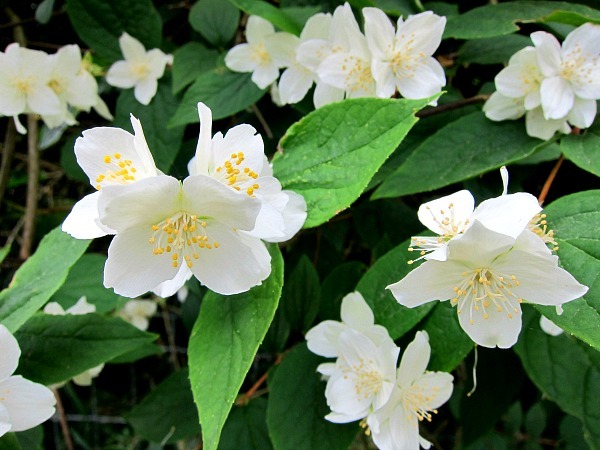 Mock Orange (Philadephus lewesii): This Northwest native shrub is a beloved bloomer around this parts, sporting sparkling white flowers punctuated with starburst stamens. One Philadelphus can perfume an entire garden, and inspire your inner poet. 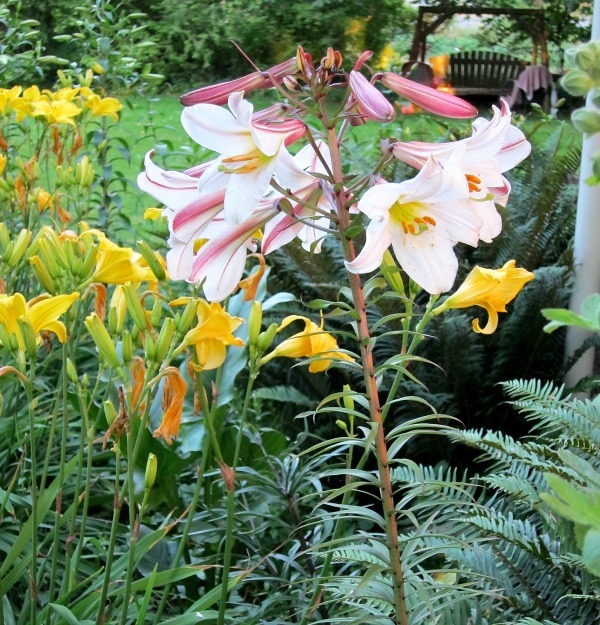 Regale Lily (Lilium Regale): Perhaps my favorite lily for its classic beauty and tough-as-nails habit. Toss in a dreamy, wafting fragrance, perennial nature, and ability to bloom just about anywhere with good drainage, and you have winner in the bulb department. 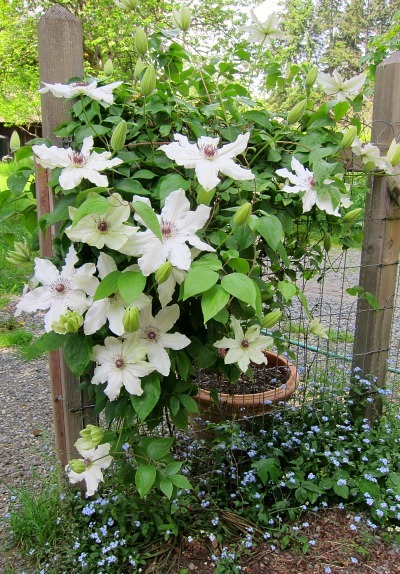 Clematis “Fragrant Star”: Such a beautiful and well-behaved vine crowned with a showy constellation of white blossoms. Most clematis lean or meander on a fence or trellis as if ready to faint. Borne on woody stems, the vine’s airy habit, gentle twining and welcoming presence make it a happy sidekick for any garden gate. 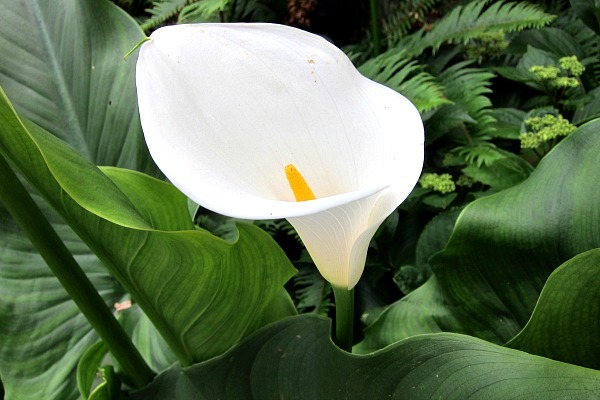 Calla lily (Zantedeschia aethiopica): A stately lady in any garden, and a wonderfully hardy calla in the Pacific Northwest (Zone 8). While it takes a few years to establish (sleep, creep, then leap), this brilliant baton is unrivaled in elegant stature and vase life as a cut flower. Callas can take a little more drought than usually reported. In late dry summers, the leaves may die down, and the rhizomes go dormant, sleeping it off until next year’s spring bloom. 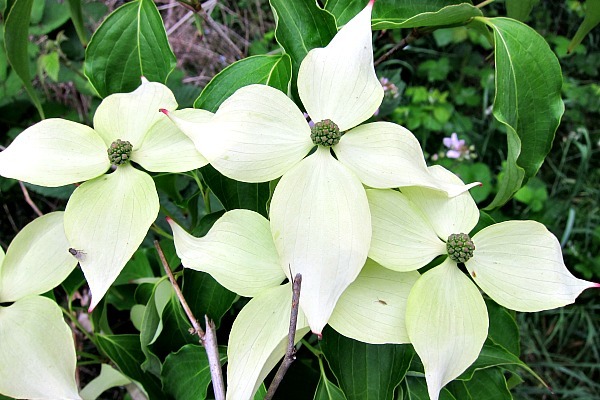 Kousa Dogwood (Cornus kousa): Kousa dogwoods offer a hardiness and disease resistance not usually associated with their more temperamental cousins Cornus Florida. As a result, Kousa dogwoods have been bred to create an amazing array of cultivars perfect for the ornamental garden. Blue Shadow (shown above) is front and center in my garden, sharing its flowers in spring and colors in fall. Madame Alfred Carriere Rose: She’s French. She’s sassy. She’s gorgeous. She’s a repeat performer and unapologetic patron of perfume. What’s not to like about a rose that performs on all levels. This almost-thornless rambler is my all-time favorite rose, which is saying a lot. In my former garden in Seattle, my entire gazebo was draped in bowers of blossoms like a ballgown for the garden. 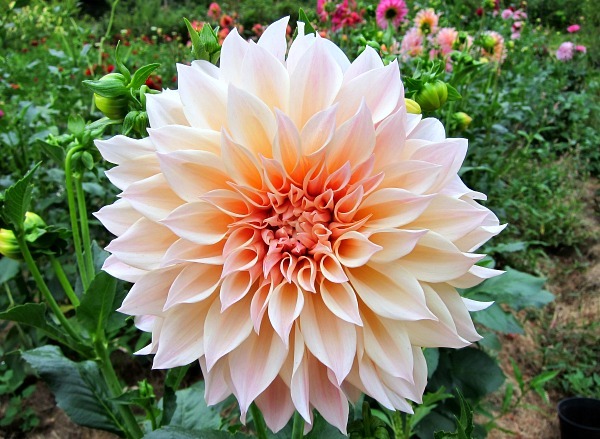 Cafe au Lait dahlia: For those of us who like a little coffee with our cream. This dahlia is another powerhouse performer —a beautiful repeat bloomer that lavishes me with flowers perfect for cutting. While dahlias aren’t fragrant, their decorative forms and colors celebrate the garden like no other flower. Dahlia tubers are hardy to about Zone 8, and lucky for me we had a mild winter and all of mine survived in the ground. Most garden guides suggest you remove and store tubers over winter. I leave them, mulch heavily and cross my fingers. i have so many of the same things in my garden! mine have already bloomed though. Hi Joyce, yep it has been an early early year. I would say we are about three weeks ahead of schedule in the garden. Hi Tom, I love reading about your garden, illustrated by your gorgeous photographs! 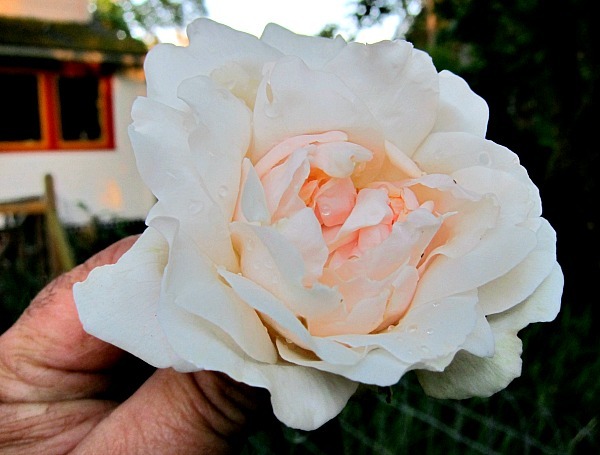 Here in the Willamette Valley, things have been bustin’ out early, due to our warm weather – roses in April! Calla lilies, then rhodies, then lavender – hard to keep up, something astonishing blooming every time you turn around! My only disappointment is that my mock orange (in its 4th year now) hasn’t bloomed this year or last. We gardeners must be a patient lot. I have a Clematis Montana “Wilsonii” to plant and have great hopes for it. Patience and hope: the gardener’s mantra. Thanks Lucy, I love the Willamette Valley. Talk about God’s country. Your gardens sounds pretty wonderful; here’s to a good growing year and next year’s blooms! Gorgeous Tom…and so true! The gardens need such delightful variety and the color of white throughout! I really enjoyed the glimpse into your glorious gardens Tom, thanks for sharing! I’ve never planted Callas before but was given some bulbs earlier this year that I have never planted and have been wondering if it is too late to plant Callas in zone 5, it has been a very rainy season so far and now it’s gotten quite hot the last few days- up in the 90’s. Your post about using a kiddie pool for a pond fountain is what brought me to your blog, via Pinterest. Did you use a pot that was made specifically for holding water? How has it held up? I really am very interested in giving this a try. MC, I say plant them! They may just surprise you and make an appearance. If they do thrive, you’ll need to pull them up before the first frost in a Zone 5, and store in your basement over winter. As for the kiddie pool retaining pond for the fountain, it has stood up beautifully. I just replaced it recently with a rigid and deeper retaining pond, only because I found one on Craigslist for very little. The pot is simply a garden pot with a three drainage holes on the bottom. I just plugged two of the holes with stoppers and ran the pump line hose through the third, which allows the pump water to flow in, up and over the sides of the vessel. The pot sits on a stack of bricks to bring up to water height. I added a couple gnarly, twisted madrona branches on top of the pot, so the birds have a place perch and drink. The bees love it, too! The fountain sounds lovely, Tom. Can we see a photo? I “resemble” your comment re busting out all over …no truer words for sure. Fabulous photo’s of your gorgeous garden and great ideas for future reference. I particularly love the clematis and that sassy rose too. Now if we could just get the siding completed on the house. I’m afraid by the time we’re finished I’ll have to start re-staining all the cedar shingles. Apparently there’s good crabbing right now and we’ll be heading out on Monday for a day on the bay. Hope they don’t hear we’re comin’ and high tail it out. Love the clematis and dahlia! I didn’t get around to it this year, but I’d like to randomly plant dinner plate dahlias throughout my vegetable garden… Stay cool. I just heard about the extreme heat heading your way. Just another random visitor from trying to get hints on what to plant in my Pacific Northwest garden. Can I ask what that groundcover with the adorable blue flowers underneath your “Fragrant Star” Clemantis is? Those would be wonderful little forget-me-knots, which reseed themselves annually. One of the first things to bloom in late spring, forget-me-knots don’t stay around too long, but are reliable in showing up each year once you scatter the seeds about. I’m having a 5 X 28 foot cedar arbor put in my backyard and plan to put climbing roses on it. I was thinking about Eden and Sombreuil. But I like Madame Alfred Carriere too. It’s hard to narrow down the list to just 4 roses! Do you have a favorite rose seller? Hi Janet, I grew Eden at my Seattle house, and it was okay but I like Sombreiul and Madame Alfred Carriere better, as they were both fragrant and Eden was not. Also, Eden was so floriferous and heavy headed that it had trouble opening up in wet spring and autumn weather. As for favorite Rose sellers, I do like Heirloom roses in Oregon, where most roses are sold on their own rootstock. They come small, but take off pretty quickly. Sally Holmes is a beautiful single white climbing rose, something to consider. Good luck!